AMBOY – Don’t spend Spring Break inside! Come celebrate Earth Week at the Amboy 4-H Environmental Education Center with a Geocaching Egg Hunt. 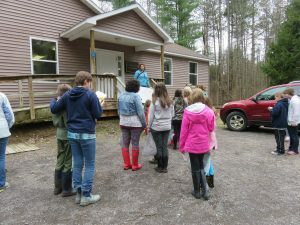 Last year’s Geocaching Egg Hunt participants gather for instruction! On April 17 from 9:30 – 11 a.m., this family-oriented program will teach participants how to use a GPS unit and then hunt for eggs in the woods. Bring your own GPS if you have one, or borrow a GPS unit from Oswego County 4-H for the duration of the program. Please call the office at 315-963-7286, Monday through Friday, 8:30 a.m. to 4 p.m., to register. There is a program fee of $4 per person or $12 per family, and children younger than three are free. Participants are encouraged to dress for an early spring hike.